The Belker is yet another monster that I never paid very much attention to, just kinda going 'ehhh' whenever I came to it's entry and moving on to fire horses and other more traditionally cool monsters. I finally got around to actually reading its entry and I realized, holy canoli, this fella is hella horrifying. You know Scratchtasia? That Itchy and Scratchy version of Fantasia where Scratchy chops up Itchy into powder, then accidentally breathes him in, and then a million microscopic Itchies hack him to pieces from the inside? That's essentially what a Belker can do to you. These creatures are air elementals assossiated with the more smokey aspects of air. 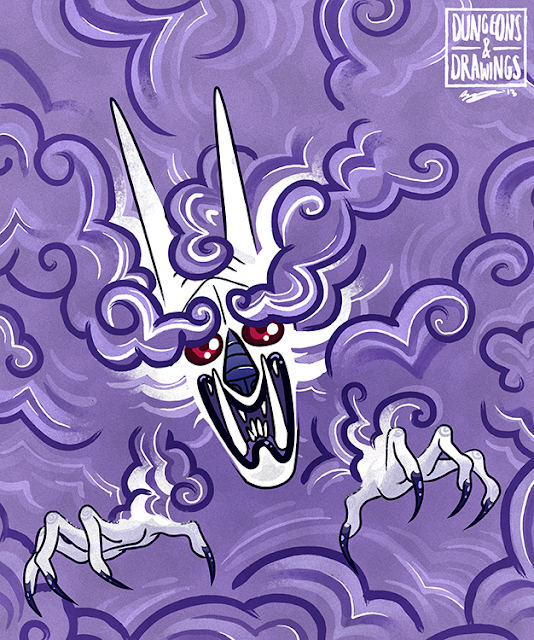 They appear as vaporous devils, though they can turn into actual clouds of smog that can either casually float away or do the earlier mentioned shenanigans to your respiratory system. I LOVE Belkers. I once squared my gaming group off against a belker/mimic duo that was terrorizing an inn. The fight took place in the kitchens, where the pair was masquerading as a 'haunted teakettle.' The mimic took the form of the kettle and went hopping around, as the belker poured out through the spout in its vaporous form, doing its thing. They killed the belker first, after which the mimic convinced the party it was actually a benevolent magic item (mimics can speak common, people seem to forget that) and that the belker was an evil entity that was forcing it to do its bidding. Long story short, they bought the story, took the mimic with them, and then in the middle of the night it tried and failed to strangle a slumbering party member to death, heheh. Now that's an absolutely wonderful story. I really like it when people get creative with monsters. Amazing. I have to test this combo someday!